Silver Star Video Slot Guide & Review - Casino Answers! Silver Star is a 5-reel, 25-line video slot developed by Cryptologic, featuring a wild substitute symbol, scatter wins and a bonus game. You can play the Silver Star video slot game at Casino Joy and InterCasino. You can bet $0.01, $0.02, $0.05, $0.10, $0.25, $0.50, $1, $2, $5, $10 and $20 per line. You can play 1-25 lines on the Silver Star slot machine. You can bet as little as a penny on the Silver Star video slot up to the highest total bet of $500. To play all 25 lines on the Silver Star video slot, hit the “Bet Max” button. For all other wagers, you can press the “Spin” button. 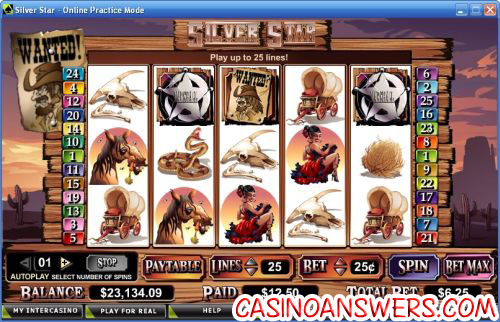 The Sheriff is the highest paying symbol on the Silver Star online slot. 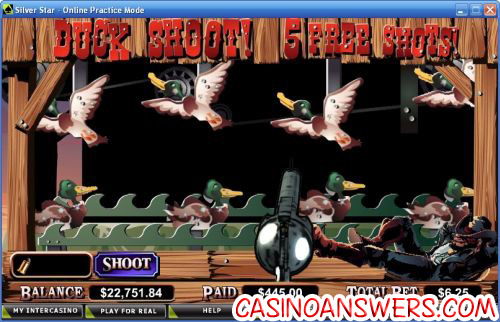 If you hit 5 Sheriff symbols on a payline in Silver Star, you will win the 5000 coin top jackpot. The Sheriff symbol is wild and it substitutes for all symbols in Silver Star except for the Scattered Silver Star symbol. Another high paying symbol on the Silver Star video slot is the Wanted poster, which will pay up to 1000 coins. You can win these payouts on Silver Star at Casino Joy! Silver Star has an autoplay mode that is found at the left of the game buttons. You can play up to 99 autoplay spins. There are no stop settings available. You can stop autoplay at any time on the Silver Star video slot. Payouts are displayed on the Paytable. Payline wins are multiplied by the bet per line. Highest win amount is paid on each selected payline. Scatter wins are multiplied by the tital bet and added to payline wins. Feature wins are added to scatter and payline wins. Win combinations pay from left to right only except for the Scattered Silver Star. The Sheriff symbol substitutes for all symbols except for the Scattered Silver Star. Silver Star has a good bonus game that from personal experience can lead to huge wins. It also has some good payouts. If you’re a fan of John Wayne, Clint Eastwood and other great western heroes, we think you’ll enjoy playing the Silver Star video slot at Casino Joy! Can USA players play the Silver Star slot game for real money? Players based in the United States of America cannot play the Silver Star video slot for real money. However, American players are able to play the Western Wildness video slot at the USA-friendly Mayan Fortune Casino. Can I play a Flash game of the Silver Star video slot? You can play an Instant Play version of the Silver Star video slot at Casino Joy for real money. If you experience difficulties with the Flash Instant casino, download the latest version of Adobe Flash Player. Where can I play other western video slots? You can play the Wanted Dead or Alive video slot and Silver Bullet video slot at Omni Casino.